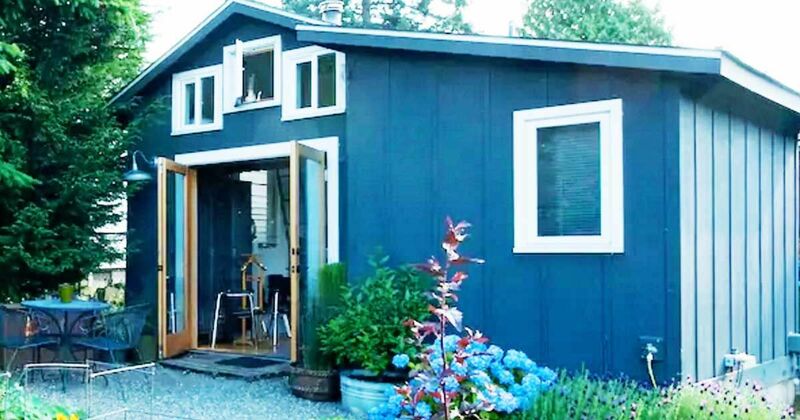 Once a dilapidated garage, this one-room minihouse is now a peaceful retreat just outside of Seattle, Washington. 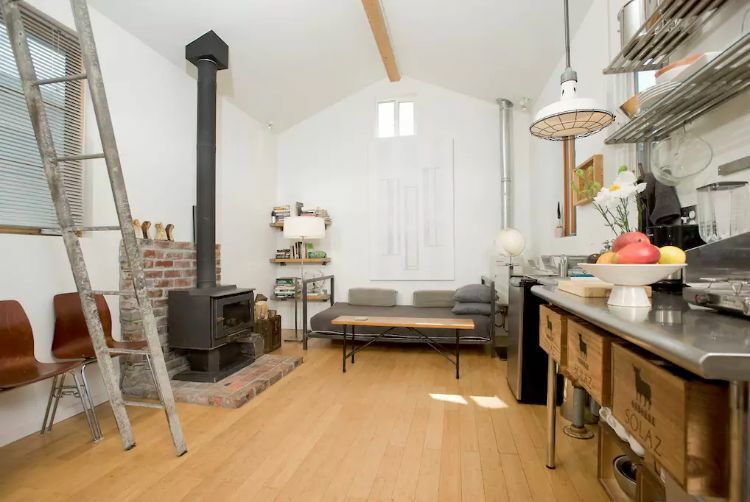 Artist Michelle de la Vega designed the home and lived in it for five years before putting it up as a vacation rental through Airbnb. The beautiful open space is only 285 square feet (26 sq. 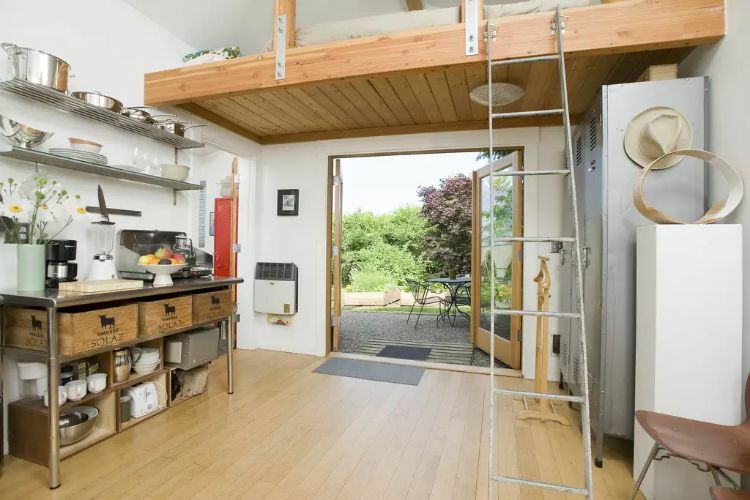 m) and consists of a living space, kitchenette, bathroom and cozy sleeping loft accessed by ladder. Artistry and attention to detail shine through in every nook and cranny. Take a walk through this unique house in the full tour below. The main floor is open and airy with tall vaulted ceilings and plenty of bright windows. Pure white walls paired with warm bamboo flooring create a blank canvas for the one-of-a-kind salvaged materials and furniture. The living space is simple yet interesting. 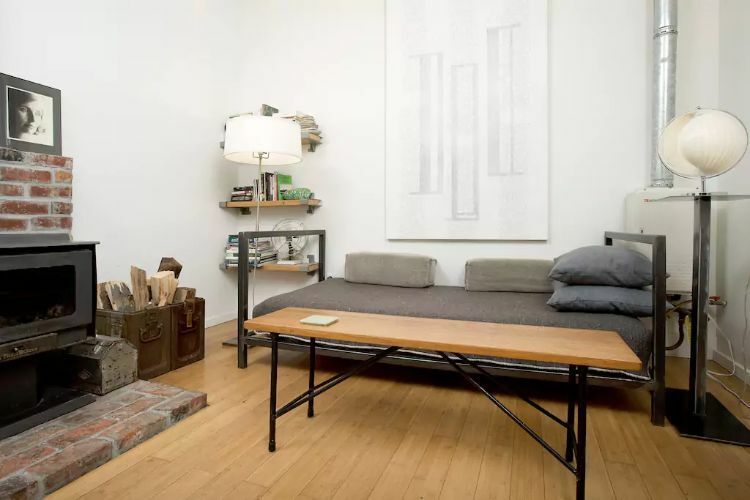 The daybed doubles as a sofa, and a column of bookshelves turns the space into a lovely little reading nook. The studio-style kitchenette consists of a stainless steel work table and matching stainless steel shelves. The exposed sink and industrial light fixture lend farmhouse style to the space. The sleeping loft is accessed by an old ship ladder. Just outside the French doors are a thriving vegetable garden and scenic views of a nearby mountain range. 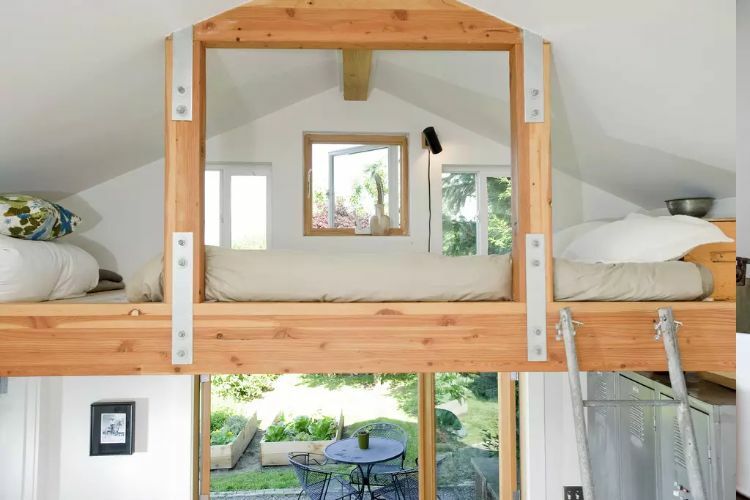 The vaulted ceiling and exposed wood framing create the perfect little alcove for the sleeping loft. Three little square windows provide beautiful views and allow in the cool evening breeze. 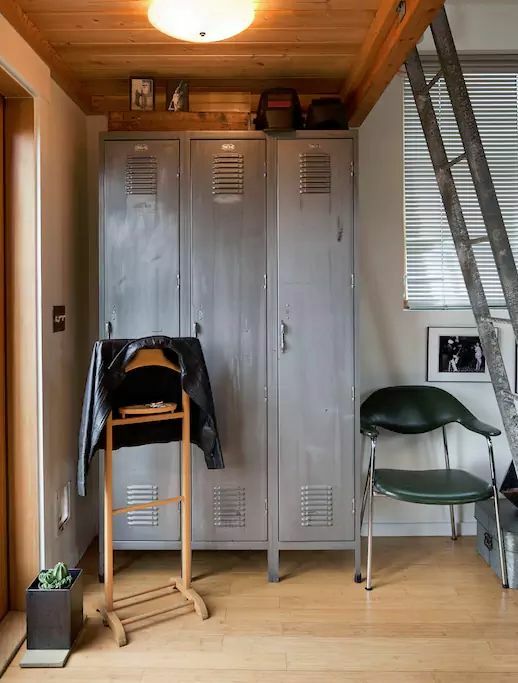 These salvaged steel lockers are located under the sleeping loft. They provide practical storage as well as chic style. 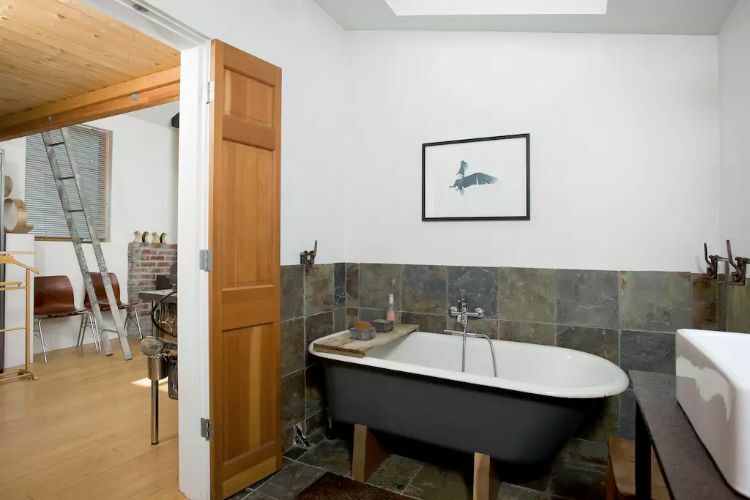 The large bathroom includes slate flooring and a skylight, soaking tub and handheld shower. The freestanding soaking tub stands on wooden legs. 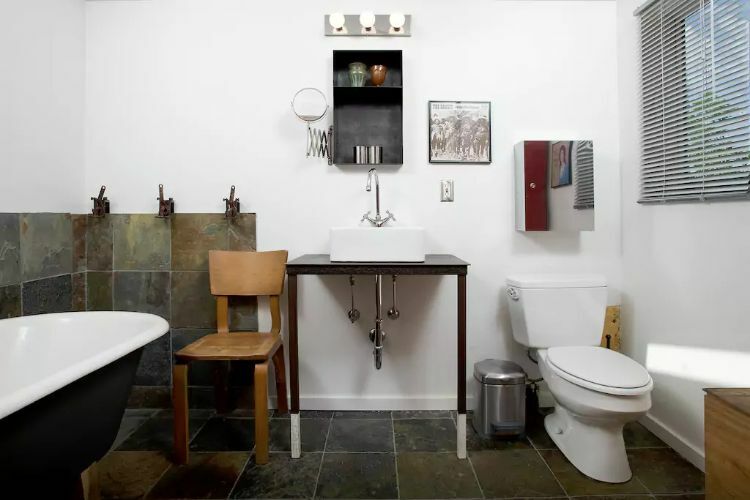 The whole bathroom has the same distinct style as the rest of the home. 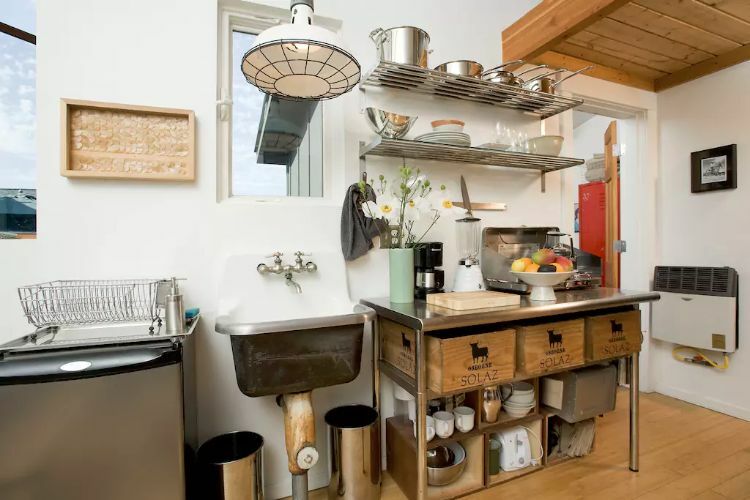 This view shows the vessel sink built into a salvaged steel table and matching steel medicine cabinet. Would you spend time in this little house? Share it on Facebook to let us know!